Mother's Day is about honouring the women who helped shape our lives. 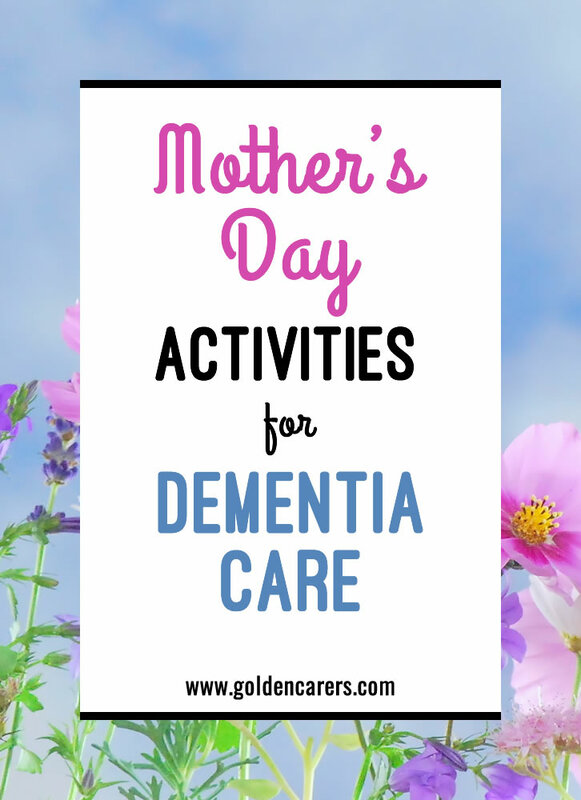 While this day holds significance for many, it can also be an excellent opportunity for residents with dementia to engage in sensory and cognitive stimulation. Sensory stimulation plays a large role in assisting with quality of life for long-term care residents. As the name suggests, sensory stimulation involves activities which simulate any of the five senses: sight, sound, touch, smell, and taste. Common symptoms of dementia include agitation, restlessness and poor quality of sleep. Sensory stimulation has shown to decrease these symptoms. Cognitive stimulation is another intervention strategy offering a range of activities to encourage thinking, concentration and memory. Cognitive stimulation is generally practiced in a small group setting and is an enjoyable activity. Any cooking/baking using cinnamon (hot cross buns, apple pies, Suisse rolls, hot chocolate). Turnips or cabbage. These vegetables are not so popular now but used to be a staple in many houses in times gone by. The act of baking, specifically bread or loaves which require kneading, provides an excellent source of sensory stimulation through touch, smell, and of course, taste when the product is complete. While baking may be a simple activity, it does require concentration and with the added component of family recipes it can stimulate memories. Recipe sharing is also a simple activity which encourages family involvement, cognitive and sensory stimulation. If possible, reach out to the family members of residents to receive a family recipe. Compile these recipes into a book and give a copy to each resident. If time permits, bake some items from this book. Mother’s Day brings about many emotions, specifically for those who have lost their mother or child. Honour them this Mother’s Day by creating cards for lost loved ones. Cut out love heart shapes from coloured paper. Have those who have lost a mother, child or influential woman in their life, write a letter to them (or write on the cards for them if they find this difficult). Seal this in an envelope and use some ribbon to hang the notes in a tree in the garden or a nice place inside. The act of writing a letter to a loved one who has passed can be powerful. It stimulates touch and sight sensors and involves concentration, thinking, and memory. This Mother’s Day utilise gardening for sensory and cognitive stimulation by planting flowers in honour of loved ones. Horticulture therapy provides many health benefits for dementia sufferers. It is an easy and enjoyable activity which can be completed individually or in groups. Ensure there is plenty of cool water and shade available and the tools are safe for residents to use. Scrapbooking offers a form of reminiscence therapy. Reminiscence therapy assists in stimulating remote memories which don't deteriorate as quickly as short term memories. Reach out to family members to collect photographs from different time points for scrapbooking. Work with the resident to determine a theme for the book and the order of photographs. Encourage story telling about the photographs as the activity continues. Everyone enjoys some pampering every now and then. Massage, in particular, offers many health benefits. Massage can help reduce stress hormones, stimulate the lymphatic system, improve circulation and reduce muscle tension. While most carers are not qualified massage therapists a simple hand or foot massage can also offer health benefits. Hand massages provide relaxation and can improve finger and wrist motion and enhance circulation. Set up a pampering station with dim lighting, soft music, lotions and nail polishes. Offer hand/feet and shoulder massages, remember that elderly skin can be frail; gentle strokes and relaxing massage oil (200 ml sweet almond oil and 15 drops of lavender or geranium - shake well). Ask which polish they prefer and gently paint finger and toe nails. For added sensory benefits ask if the resident would like to paint the nails of one of his peers for added sensory activity. Thank you so very much for your feedback Jane!